One of the most critically beloved new shows on cable, Showtime's Penny Dreadful is written start to finish by Skyfall and Hugo screenwriter John Logan and produced by Sam Mendes, with Eva Green, Timothy Dalton and Josh Hartnett in the leading roles. The Victorian Gothic mash-up features characters pulled from Frankenstein, Dracula, The Picture of Dorian Gray and other, stranger texts, but the key to Logan's obsession with monsters is his sympathy for them. He has a harder job in pre-production this year than last: Showtime president David Nevins liked the show so much that he renewed it for a longer (ten-episode) season two. In the runup to Sunday night's season one finale, Logan explains how Disneyland, romantic poetry and classic horror stories gave rise to one truly original series. 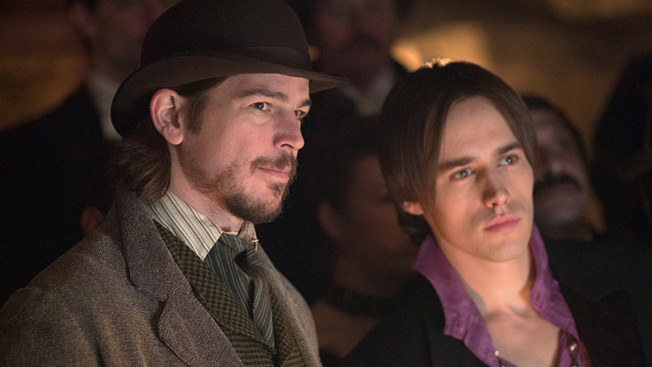 Where did you first start talking about Penny Dreadful? This is completely true: after about 10 years of thinking about this and not telling anyone, not my partner, not my agent, I was with my friend Chris King, who's a producer on the show, and we were at Disneyland, and we were standing in line and I said, "I have an idea for a TV show." And as any writer will tell you, when you first say that out loud, it's a really treacherous moment, and Chris really loved it and really got behind and then I had to go to Sam. I've known Sam for years and I know his sensibility. He's a stand-up guy, and he said, "Let's do this together." What was it about Disneyland that freed you to make that pronouncement? We were in line for Space Mountain and there was this wonderful incoherent joy about being able to speak about such dark things in such a bright place. How did you decide have all these famous horror characters meet each other? It's something I'd been thinking about for a long time. I was reading a lot of Romantic poetry, particularly Wordsworth, and that led me to Byron, Shelley and Keats and eventually to re-reading Mary Shelley's Frankenstein, which I hadn't read since I was a kid, and it just shocked me how powerful it was and how moving it was. And I just started thinking about that, and the themes that Mary Shelley plays with. If you read the binary narrative of Frankenstein, the question you have to emerge with is "Who is the monster, Victor Frankenstein or the monster he creates?" And the duality therein I thought was really interesting. So, I began to think about various iterations of that and I read Dracula, sort of immediately, and then I went into a study of Gothic literature, and I was staggered to find that in that period of about 1890 to 1900, there was this great paroxysm of horror literature—you had Dracula, The Invisible Man, The Picture of Dorian Grey, The Hound of the Baskervilles, The Island of Doctor Moreau, War of the Worlds, all within a 10-year span. And all the writers cross-pollinated. I thought that was really fascinating. It reminded me of the second generation of Universal horror films where Universal suddenly started mixing and matching the Wolfman and the Mummy and Dracula and Frankenstein and I thought it would be a really interesting thing to pursue. Narratively it was just fascinating—the way those characters spark off each other, I thought, could be dramatic. I didn't start off with them, actually—I started with Vanessa Ives, the character that Eva Green plays. And I just began to build that character, and her as story evolved, I thought about which elements of the classic text could come into it, and what eventually emerged was Frankenstein and his creature and Dorian Gray refracting off of parts of the Dracula story. It's definitely a rich seam—I know people have compared the show toAlan Moore's League of Extraordinary Gentlemen comics and Kim Newman's Anno Dracula novels, which work from a similar premise, albeit in different ways.